Regardless of whether or not his name is familiar, his museum provides another fascinating tale of sea exploration. The Kon-Tiki Museum is located next door to the Fram and also features two original vessels. 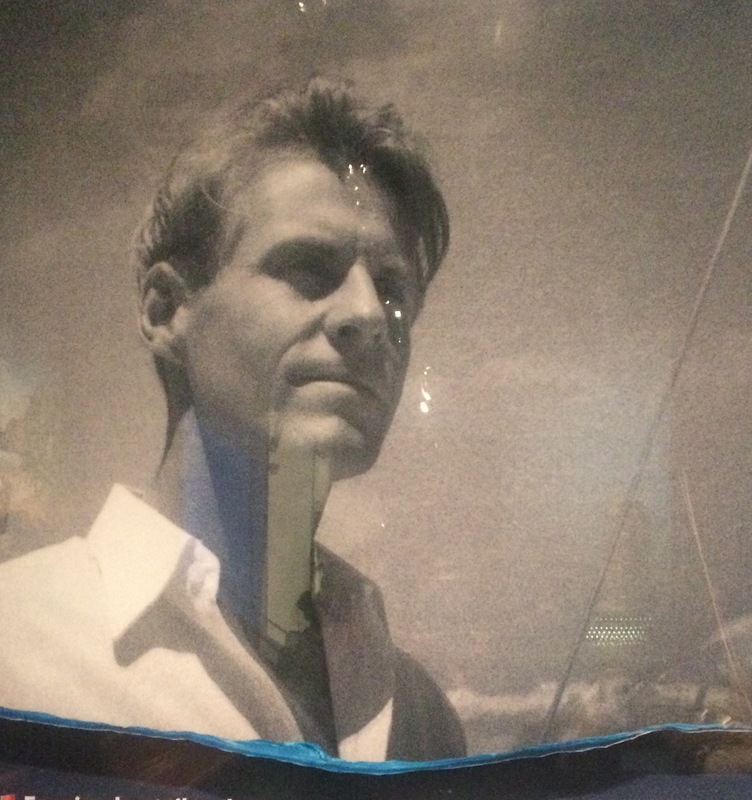 But, while the Fram covers polar expeditions by many explorers, the Kon-Tiki Museum features one captain, Thor Hyderdahl, another adventurous Norwegian. 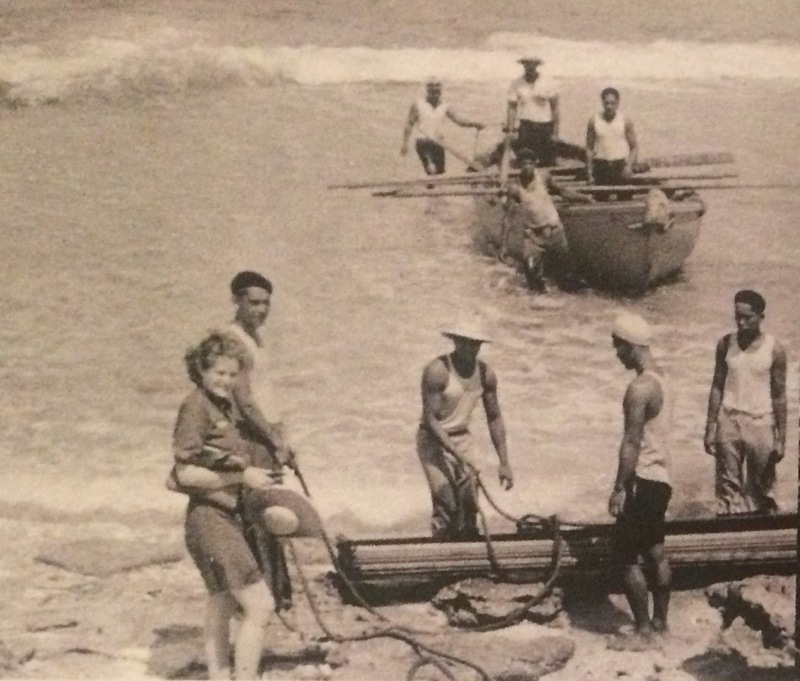 Hyderdahl and four other men set out on a balsa raft named after a South American chief, Con-Tiki Virachocha (Kon-Tiki is also a sun god). The goal? To prove Polynesia had been populated by South American natives. Hyderdahl came to this decision while living with his wife Liv on the Pacific Island Fatu Hiva (northeast of Tahiti) in 1937-38 studying the local flora and fauna. Several factors supported his belief: an elder Polynesian said his ancestor Tiki came from a large land beyond the sea; the current flows from the east; there were similar stone statues in both Polynesia and in South America; and, further research revealed a myth of the pre-Incan chief Con-Tiki’s escape from Peru on a balsa raft after losing a battle. That was enough to launch Hyderdahl on his quest, resulting in a new field of study: maritime experimental archeology. Others, however, completely disagreed with this Norwegian’s theory. This opposition only served to spur a determined Hyderdahl even more. This trait continued to serve him well his entire life, one of constantly questioning long-held beliefs. Gathering a crew of five, including the WWII hero, Knut Magne Haugland (who had participated in the famous sabotage raid on the heavy water plant in Rijukan 1943), Hyderdahl proceeded to construct a vessel last built centuries ago. Organizational skills, contacts, and charm, along with determination, helped Thor in his preparations. The U.S. Navy donated much of the required equipment (from sleeping bags to suntan lotion), and the Peruvian president gave him access to the country’s naval base for building the raft. 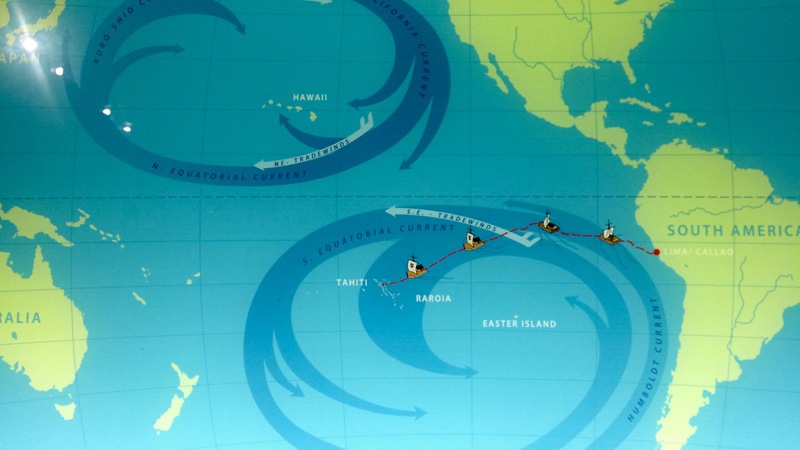 and landed 4,300 miles away on an atoll near Tahiti 101 days later (just one day past Thor’s estimated travel time). Although it was a crash landing over a reef and through powerful waves, all survived including the equipment. Considering the team, with the exception of Haugland, lacked experience of being at sea, it’s a miracle they managed to survive. What’s even more surprising, to me, is Hyderdahl supposedly couldn’t swim. 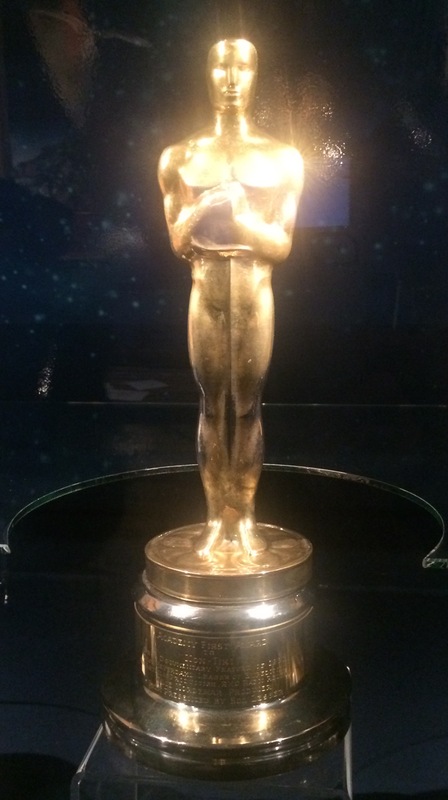 Unbeknownst to them their regular radio broadcasts had captured the world’s imagination, and their filming of the voyage garnered an Oscar in 1951 for Best Documentary. Although the voyage was a success, the question of who settled Polynesia remains inconclusive, especially with a 1990s DNA study of the inhabitants showing more of an eastern Asian influence than South American. What KON-TIKI’s voyage did prove is the possibility of cross-migration between South America and the Pacific. Support for the theory of cultural exchange comes from other DNA studies: Chile’s pre-Columbian chickens whave Asiatic origins; and the sweet potato from both areas originates in South America. Furthermore, the Polynesian word for sweet potato, ‘kumara’, comes from Quechua, a language spoken by the people of the Andes in South America. In reading a bit online Hyderdahl’s theory has been disputed. In the 1970s several voyages using ancient navigation and landfinding (rising and setting of the sun and stars, wave-riding or discerning the direction of the swells, knowing flight patterns of birds and cloud formations) demonstrated the more likely scenario of the Polynesians landing on South America, not the other way around. But, Hyderdahl’s voyage is still a wonderful adventure. 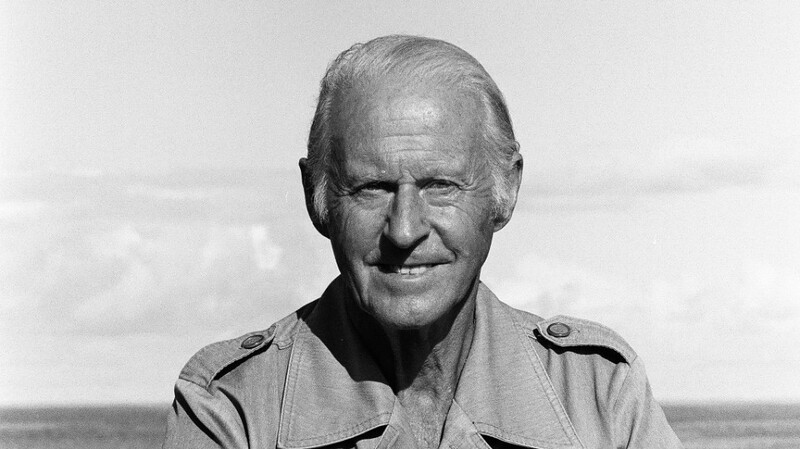 The KON-TIKI voyage began Thor Hyderdahl’s journey to discovering more about man and his travels. His curiosity also seemed destined to proving cultural relationships others dismissed as nuts. Which is why he ventured to the Galapagos Islands in 1953. Those who challenged Hyderdahl insisted islands closer to South America should also show evidence of early human habitation; yet, no one had found such artifacts on the Galapagos Islands. The gauntlet thrown by the establishment led Hyderdahl to unearth almost 2,000 pieces proving human visits going back to prehistoric times. The verdict is still out, since an explanation can be made that the artifacts came from European travelers, possibly pirates who had left behind Peruvian pottery. Testing is currently being performed to date the pottery to see if, indeed, pieces were left by Ecuadorian fishermen before European visitors. Another island in this part of the world fascinated Hyderdahl: Easter Island and its moai, the giant standing stone monoliths. 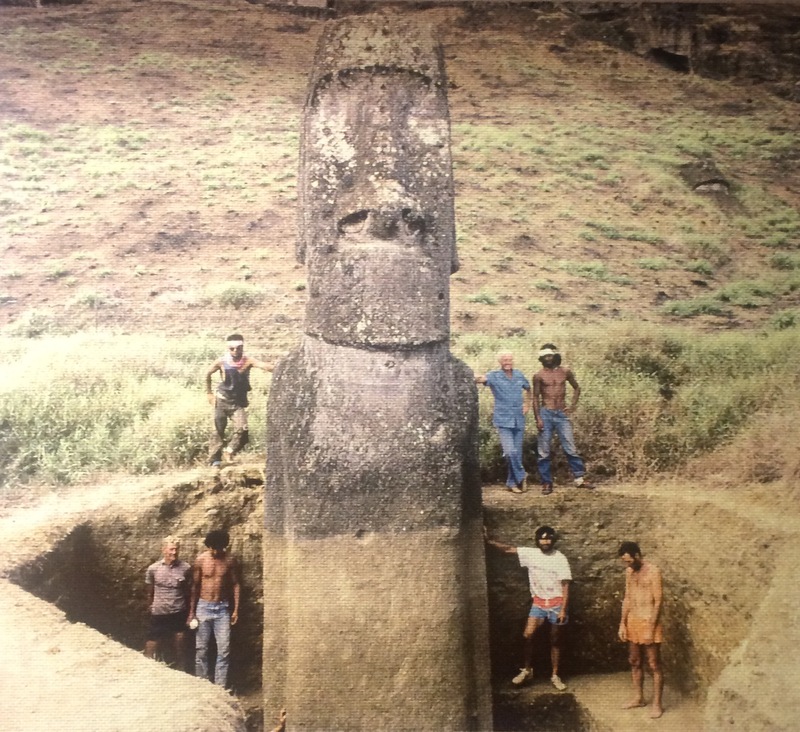 In 1955-56 during his studies of the moai he became the first outsider to be given access to old family caves. These secret ancestral caches held thousands of small stone sculptures. 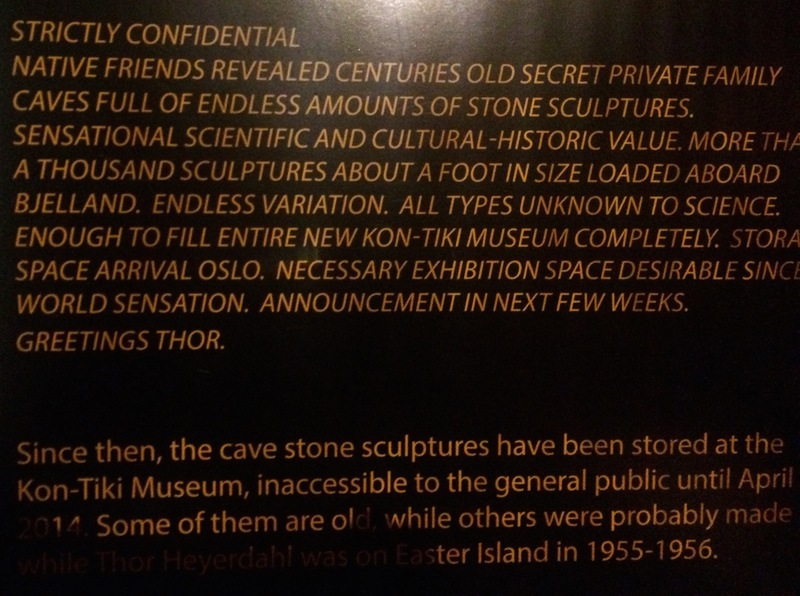 Thor was also given permission to take samples for study, alerting his contacts back in Norway with the following telegram. Only recently (April 2014) have these stone sculptures been made available for public viewing. 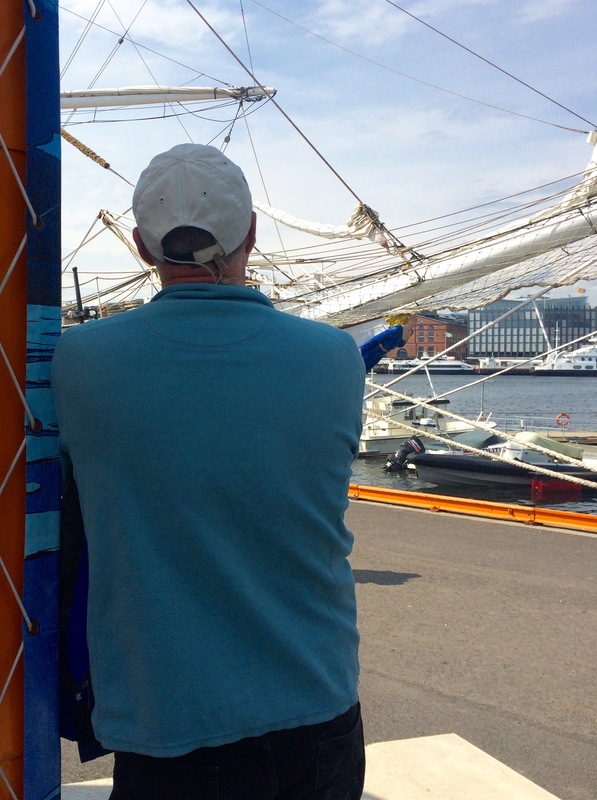 Fast forward to the late 1960s and Hyderdahl is on another maritime adventure: to explore the likelihood of a papyrus vessel from the times of the Pharaohs crossing the Atlantic. Again, South America figures into his speculation due to reed boats used on Lake Titicaca, whose shores border Peru and Bolivia. Like the Egyptians, these people employed similar pyramid designs, worshipped the sun, and mummified their dead. 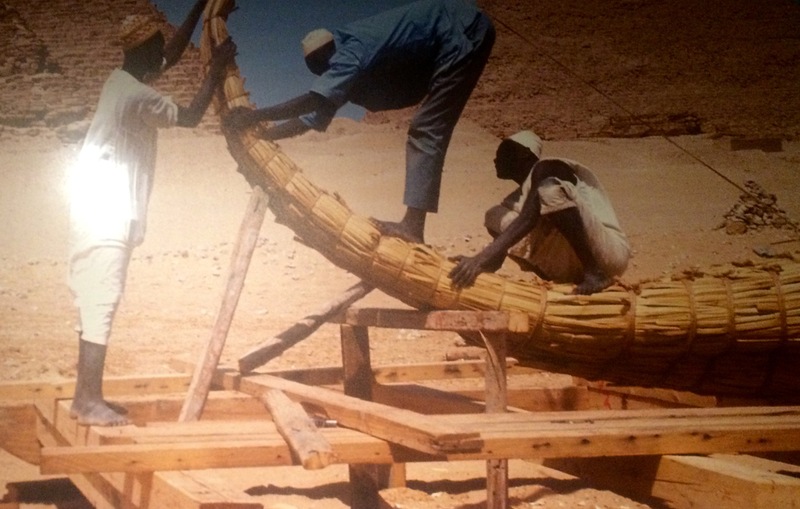 On May 25, 1969 he and an international crew of six left Morocco on RA, a papyrus boat constructed by those still using such vessels on Africa’s Lake Chad. In addition to testing his theory of an ancient Egyptian-South American exchange, Hyderdahl wanted examine the ability of men from diverse cultures co-habitating on an isolating journey. For this reason, the United Nations, an organization devoted to creating unity among nations, allowed him to hoist their flag on RA. This time lack of a test voyage resulted in failure. The RA began coming apart within two weeks. After 50 days at sea and still 650 nautical miles from Barbados they called for help and were rescued. 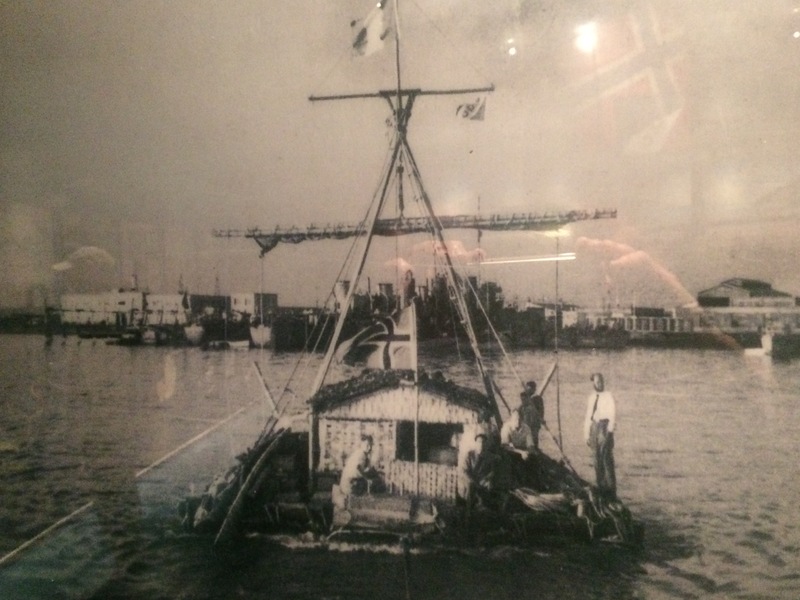 Undaunted, in less than a year Hyderdahl and a new international crew were back at sea, on RA II, constructed in Morocco by Ayamara Indians brought in from Lake Titicaca. They reached Barbados 57 days later on July 12, 1970 covering over 6,000 km at sea. Although completing such a trip contributed to further understanding of ancient human’s travels across seas, a more important discovery happened thanks to personal hygiene. 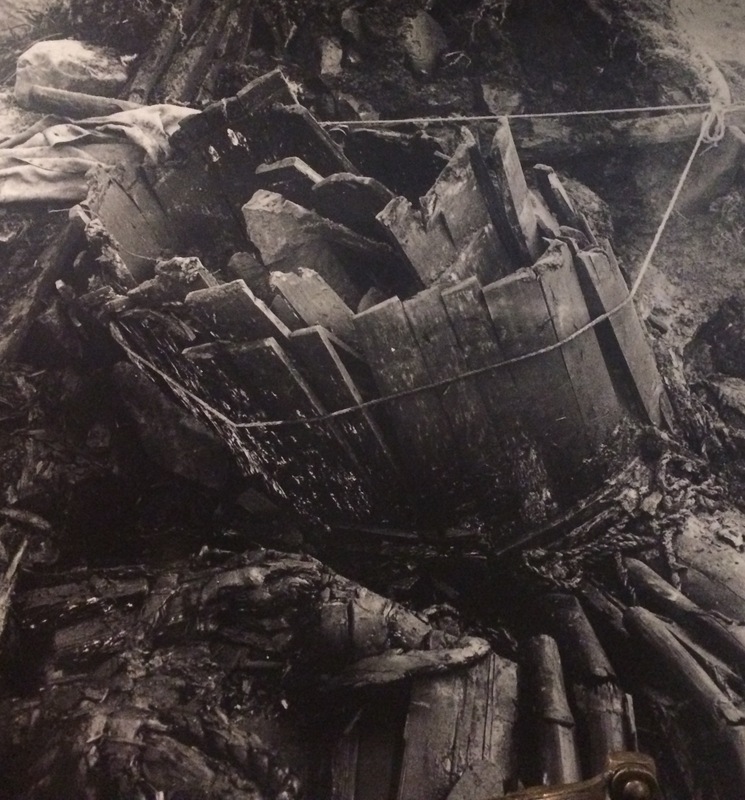 While on the first RA voyage the crew noticed small clumps of oil floating around their craft. Soon, they couldn’t even dip their toothbrushes in the water without getting tar in the bristles. Hyderdahl alerted the UN who got involved as well as the U.S. Congress. In 1972 oil tankers were banned from discharging oil in the open sea. This determined Norwegian pursued his curiosity throughout his life. Easter Island and its mysteries continued to attract his attention. In 1986 he with the locals and Pavel Pavel, a Czech engineer, managed to recreate the ‘walk of a statue’ described in an oral tradition. But, beyond his dedication to the study of archaeology and ancient humans, Thor passionately worked to protect the environment for present and future generations. 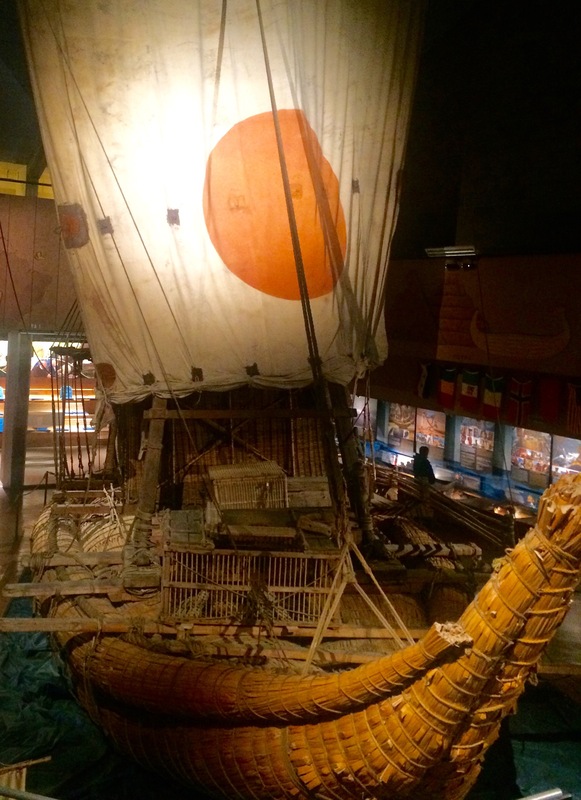 I had entered both the Fram and the Kon-Tiki Museums believing my respect for the people featured would be based on their polar and tropical explorations. I left with even greater admiration for less-publicized feats, such as Nansen’s work with refugees and Hyderdahl’s concern for the environment, two issues even more dire today. From vessels built of balsa and reeds to those of oak and pine. 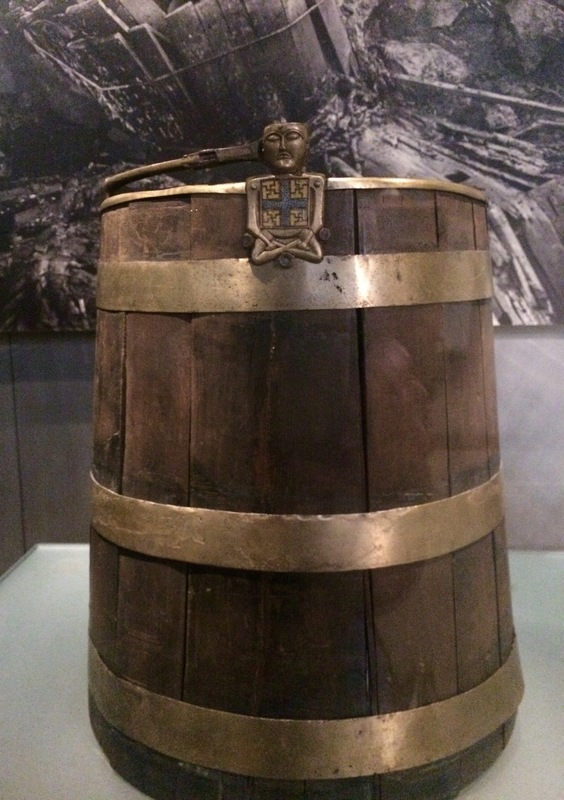 Our next maritime museum covered the Viking era (late 700s to mid-1000 C.E.). 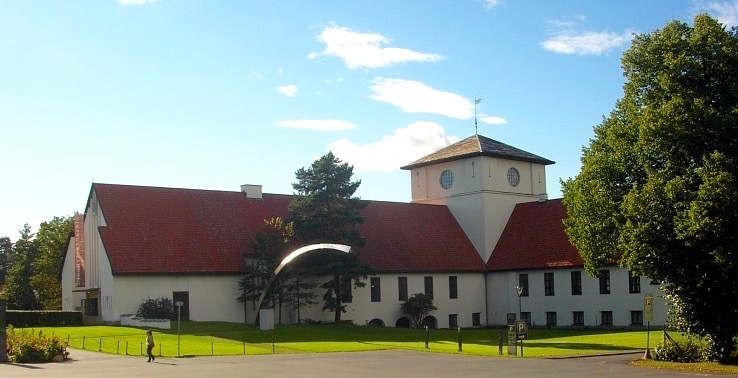 Four ships, all uncovered from burial grounds (which is what protected three of them from complete disintegration) found within the southeast area of Norway, are housed in a building resembling an old monastery. When you enter, a wall map charts the expanse of the Vikings’ travels. We’d seen one of these before, but the scope of their voyages still stuns us. I mean, from the east coast of North America to the eastern shores of the Black Sea? In open boats, no less. 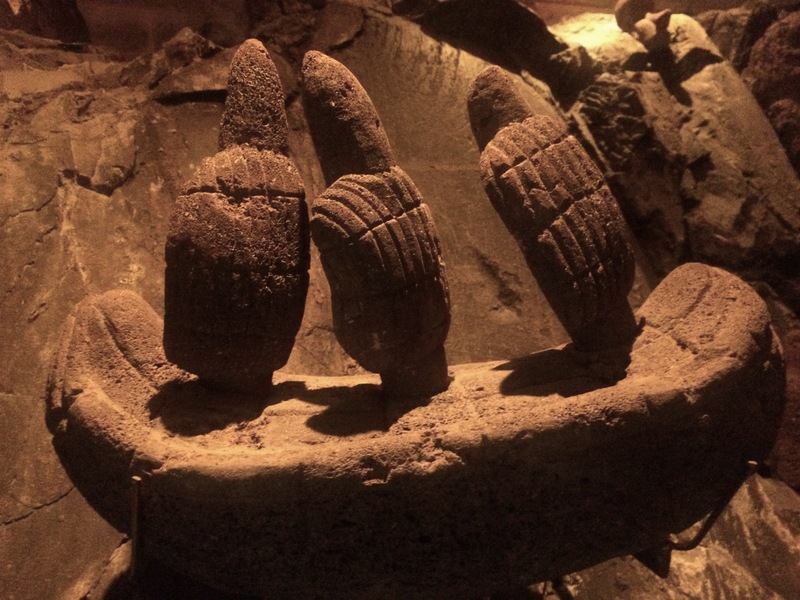 Excavated between 1852 and 1904 we saw three ships and just some iron nails of the fourth. This elegant vessel was built 820 C.E. in southwestern Norway of oak with mast, oars (15 holes on each side, for 30 rowers) and decks of pine. Iron rivets hold the siding together. This ship could reach up to ten knots (11 mph) under sail. It may not seem particularly fast but it would overtake JUANONA with our normal five to seven knots of speed. 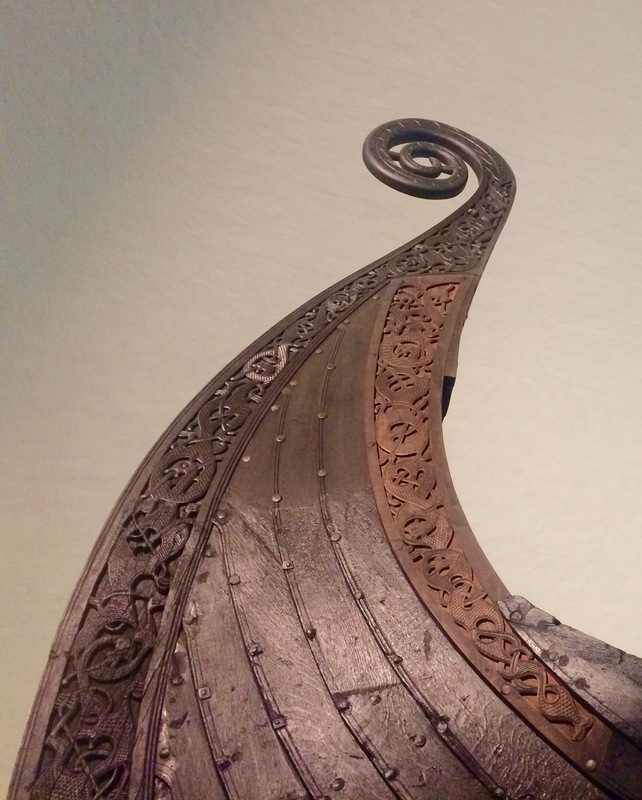 With the elaborate carvings decorating the hull, even the part below the waterline, archeologists surmise the OSEBERG would have been for local voyages used by the aristocracy of that age. Look at the craftsmanship. Unbelievable. After 12 years the ship was retired and used for the burial of two women, obviously of noble status. Their ages were between 70 and 80 for one and just over 50 for the other. The older woman suffered a serious childhood illness and in old age had advanced cancer as well as osteoporosis and a knee injury. The younger had good teeth and had recently broken her collarbone prior to her death. As if that isn’t specific enough from skeletons over 1,000 years old, they said she picked her teeth with a metal toothpick…! In spite of grave robbers looting jewelry and weapons, the composition of the moist soil with a covering of clay and turf preserved numerous treasures–treasures more valuable than gold considering the information they provide about how these folk lived. The women were placed on a bed with linens in a burial chamber behind the mast. 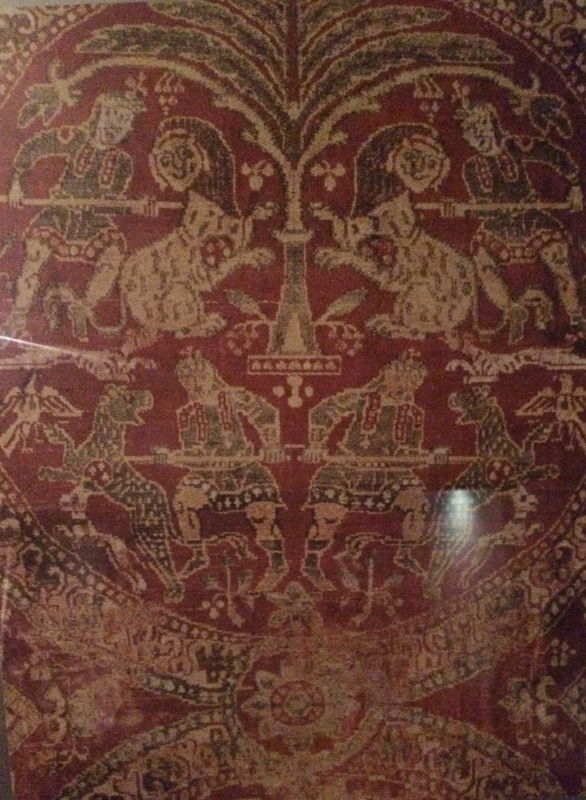 Composed of wool and linen, tapestry scenes on the various fragments depict battle scenes and processions. Unlike the large blocks of cloth hanging in castles and manor homes in more modern times, Viking tapestries were more like vertical banners, possibly used for special occasions. Pieces of silk embroideries (imported from Central Asia and the eastern Mediterranean) and fine woolen fabric were also found, with some representing foreign influence, such as the use of floral patterns. Five delicately carved animal heads with 20″ long handles were located aboard, supposedly created by five different craftsmen. Four are on display, with the fifth badly damaged from age. There’s no consensus on how they were used, maybe mounted on walls to serve as protection or just ornamentation? Even without that knowledge the intricacies of each is something to marvel. Two sleighs were also found, but were not on display. Again, richly carved and also pulled by horses. The grave contained housewares (such as weaving looms, buckets, chests), agricultural tools (such as pitchfork, animal tether) and animals, the latter being a barn-full: 2 cows; 6 dogs; and, get this–15 horses. Now that’s a burial. 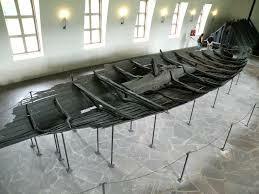 This ship was built in 890 C.E., during the Vikings’ heyday and is the largest of the four excavated. It’s also the best preserved. 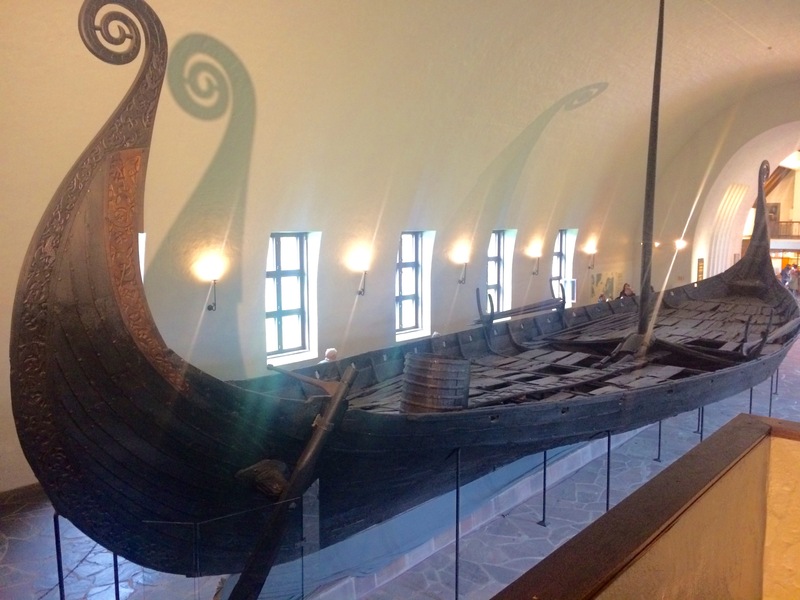 Like the OSEBERG, it was constructed of oak with pine deck, removable for stowing supplies and cargo. Unlike the OSEBERG, the GOKSTAD could sail the high seas with its sturdier mast and keel, and higher sides. It was faster, too, with a sleeker build, oar-holes for 32 men and a larger sail. Its speed could reach 12 knots vs. the 10 of the daintier OSEBERG. Buried in the ship was another wealthy individual, this one a man in his 40s, about 6′ tall, who had died in battle, most likely from a knife to the thigh (he also had a cut in the calf bone). He, too, was laid on a bed of linen in a burial chamber most likely decorated with tapestries. Like the women’s burial site, his had similar artifacts (beds, sleighs, harnesses, etc.) as well as animal sacrifices: 8 dogs; 2 hawks; 12 horses; and, surprisingly, 2 peacocks. What’s really cool are the shields found (remnants). They were painted and hung on the side of the ship. The shields would have been used on leaving or entering a harbor as a means to impress people. I know if I was on land tending my sheep and noticed a ship pulling in a fast and steady speed with 30+ brawny guys at the oars and brightly colored shields glistening in the sun, I’d be impressed. Actually, I’d be running. This ship constructed in 910 C.E. was the first to be excavated. 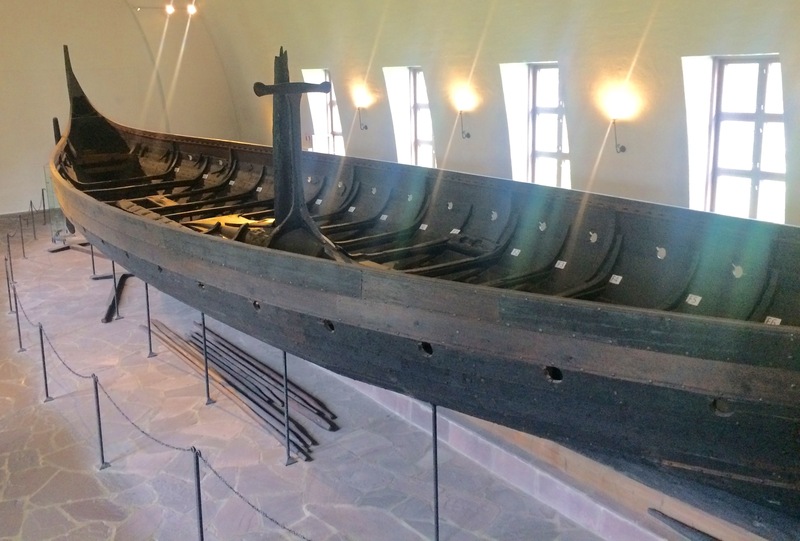 It’s smaller than the OSEBERG and GOKSTAD, but still a powerful vessel made for ocean-going voyages. The design points to possibly a transport ship for light-weight goods (glass? fur? even slaves or warriors) since there wasn’t a lot of room for cargo. There could have been 24 rowers and a good-size sail providing necessary speed to get where one wanted to go quickly. A man of wealth was buried here (I think anyone buried in a ship would be pretty well-off…) along with remains of his weaponry (sword hilt, spearheads, shield boss, and chain mail), parts of a ski and saddle, a die, some beads, cloth fragments along and unidentified wooden pieces. As I mentioned earlier, the fourth ship (the BORRE) just had some nails, so I’ll spare you a photo of those. With our visit of the Viking Ship Museum at a close, we had completed our maritime tour of Oslo’s fabulous trilogy of Norwegian ships and those who sailed them, all conveniently located on Bygdoy, the peninsula where JUANONA was docked. Three museums, multiple vessels, and dreams of lands beyond. That is so cool! Thanks for sending the link. And, yes, to accomplish that is awesome. Love it!